To know you better to propel you better is what motivates our approach. 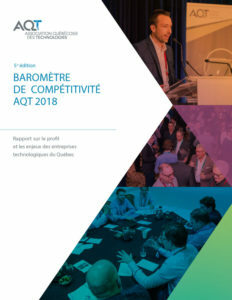 Since 2010, the AQT has been conducting a vast survey of techno business leaders throughout Quebec, members and non-members of the Association. We again commissioned SOM Research and Surveys to collect and analyze data from the 559 respondents. Thus, they can preserve their anonymity. This 5th edition, carried out in collaboration with TECHNOCompétences, focuses more particularly on the challenges related to human capital. In the context of the war of talent and the scarcity of the workforce, we wanted to quantify the extent of the obstacles SMEs face in triggering and accelerating the implementation of concrete means to support their growth. Provides statistics on which your decisions and recommendations will be based with governments. It portrays this innovation sector, providing the industry with recognition and benchmarks for business management. The Barometer of Competitiveness thus makes it possible to identify the stakes and the needs to stimulate the economic growth of the techno industry. The survey participants receive their personalized report in complete confidentiality. The most significant data of the study will be available to the general public in 4 stages on 4 main themes: challenges / management, marketing, revenues / finances and human capital. Do you want to take a look at Quebec’s techno SME? Download our first excerpt of results from the data analysis of nearly 500 technology companies responding to the study. For this edition, we will be more than ever able to know to better decide.